Andrue Oglesby receives suggestions on his research direction during a class review on March 4. Photo by Craig Chandler, University Communications. Assistant Professor of Art Stacy Asher is teaching an advanced graphic design course this semester that has students from the University of Nebraska–Lincoln involved in a collaborative design research project with students at San Francisco State University to investigate the systemic connections between these two regions within the framework of water for food. Students in the course, titled “Water for Food: Visualizing the Food Industry + Mapping Systems,” will then present their work in a small exhibit and through the publication of a zine at the 40th annual Center for Great Plains Studies Symposium “Drought” April 1-4. A zine is a small-circulation, self-published work of original texts and images. “The course is an investigation of water, food and system and using design as a language to communicate about those findings,” Asher said. Each student is designing two spreads in the zine based on their research topics. After extensive research, students selected their own area to focus on, considering such themes as graphic design and social responsibility, food and system, feeding the future, sustainability and viability, conservation and preservation, designer as witness or documentarian and designer as journalist. Asher taught at San Francisco State last year prior to coming to UNL. There, her students collaborated with Arup, a large engineering and architectural firm, to design a book about the future of water. Asher, along with Joshua Singer, the visual communication design coordinator and assistant professor at San Francisco State, published a paper, “Crafting Stories about Water and the City: Transdisciplinary Design Collaboration for Social Impact and Pedagogical Methods,” and presented their findings at an AIGA Conference in October. AIGA is the professional association for design. 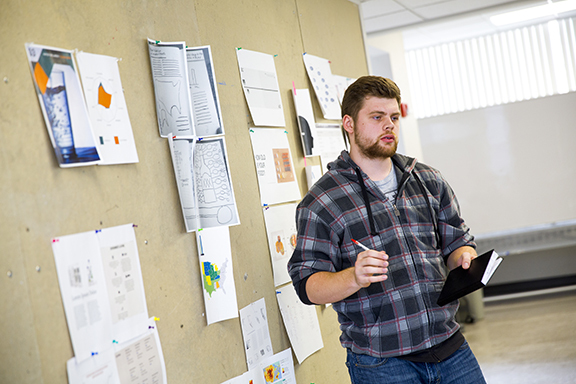 Fall semester at UNL, Asher facilitated an advanced graphic design course where students focused on the topic of water and system. This course addressed the complex issues of graphic design and visual communications centered around the subject of water. Each project or problem was carefully structured to create conditions conducive to discovering systems of design. These conditions encouraged exploration of visual communication concepts and design principles, allowing students to develop more personally expressive ways of solving communication problems. Atlas publications were designed to showcase their visual displays of information. This work will also be on display at the Drought Symposium. Design can influence what people consume and how they behave, she said. In addition to focusing on their own chosen research topics to create the zine spreads, the students at both schools are sharing narratives about the future on a class blog and completing comparative typologies for each other. So if a student at San Francisco State, for example, is interested in the water footprint of meat production, she might want to know how many restaurants serve only vegetarian food in Lincoln, Asher said. So one of her students could make a typology of that. Andrue Oglesby, a Bachelor of Fine Arts junior from Long Beach, Wash., said the course has been interesting. “It’s different from most graphic design courses because it is based mostly on research and infographics,” he said. His research has focused on the production and consumption of alcohol in the United States. Nick Sharon, a Bachelor of Fine Arts senior from Lincoln, said he now appreciates the skills he is gaining from the course. His research is focused on the production of corn and what its uses are, such as feed or to make ethanol. “I have found quite a bit on the agriculture in Nebraska and where the corn grows, but California was a little bit harder to find information on,” he said. Sharon is looking forward to presenting his results in the zine and at the Drought Conference. “I’m a little excited and a little nervous, just because I’m not really educated as well as some of the people that will be attending the conference, but I think that there is a lot of good information that people can really think about and even pass on,” he said. Asher said her goal was to make the course as real world as possible for them and give them skills they will use later. The message is also important. Sharon said designers have the opportunity to have a big impact on everything that is happening in the world. “The more that I design, the more and more I am convinced that you need to design with purpose and meaning,” he said. During the conference, participants will be encouraged to interact with the displays and provide feedback to the students. “We might have Post-It notes for people to write comments or ask questions or maybe even suggest resources,” Asher said. After the symposium, students will create a process book that shows the beginning, middle and end of their research, and they will promote the zine on social media. Asher said one of the benefits of graphic design is displaying information and communicating big stories in a more aesthetically-engaging reading. The students will leave the class with great skills, Asher said.